One of the burning questions in the Balkan history of the second half of the 19th century and at the beginning of the 20th, until the Balkan wars 1912/13, was the Macedonian question. Not only the Balkan peoples and their states were engaged in the struggle over Macedonia but also the Great Powers endeavored to master this region, as it was rather significant for their political, economic, cultural, religious and other interests in the Balkans. The policy of the Great Powers complicated to a great extent the natural and righteous solution of the Macedonian question by imposing those solutions that did not observe historical, economic, geographical and other facts, but paid attention to the long term strategic interests of the Great Powers instead. On the other hand, it was Impossible to delineate clear borders between the neighbouring peoples, first of all the Serbs, Greeks, and Bulgarians, because of the ethnic and religious medley of the population of Macedonia and the entangled cultural influences of several civilizations. This was one of the main causes of the long lasting disputes between the Balkan states and the peoples, which was also strengthened by the insufficiently articulated consciousness of the Macedonian Slav population as regards their ethnic and national affiliation. After the Liberation Balkan wars in 1912/13 and the final expulsion of the Ottoman empire from Europe, the largest portion of Macedonia became part of the Kingdom of Greece, its minor portion was incorporated in the Bulgarian state and the northern part of Macedonia in the Kingdom of Serbia. The borders that were established among the Balkan states then, and slightly adjusted after World War I, remained the same until the present times. The boundaries were defined by many international agreements, starting with the London and Bucharest Treaties (1913), then the treaties of Versailles and Neuilly (1919) between the Allies, on one side, and the defeated Bulgaria, on the other, and by a number of other international settlements, including the Paris Peace Conference in 1946. By all these treaties the territory of the present Republic of Macedonia was first defined as the part of the territory of the Kingdom of Serbia, then of the Kingdom of Serbs, Croats and Slovenes (Yugoslavia) and, finally, of the Federal People's Republic of Yugoslavia, i.e. the Socialist Federal Republic of Yugoslavia. After the Communist Party of Yugoslavia came into power at the end of the Second World War, the southern pan of the territory of the former Kingdom of Yugoslavia, which had entered the Yugoslav state as a part of the Kingdom of Serbia, was proclaimed one of the six Yugoslav federal units - the People's Republic of Macedonia, later the Socialist Republic of Macedonia. The borders between the new federal units - People's Republic of Serbia and People's Republic of Macedonia - were mostly arbitrarily set by several leading Yugoslav communists headed by Josip Broz Tito. The ideological creators of the interior borders among the federal units were the leading Croatian and Slovene communists (Tito, Kardelj, Hebrang, Bakarić). It was most important to them to inaugurate by such borders the political strategy which aimed at making the Serbian factor a marginal one under the pretext of the alleged struggle against "Greater Serbian hegemony". The real political objective - the partition of the Serbian people by interior republic borders and the fragmentation of the Serbian ethnic area - was concealed by internationalist phrases and social demagogy. The Serbian people accepted the restored Yugoslav state candidly in spite of the clear fact that the principle of equality of the peoples was substituted by the union of the republic political oligarchies. By such ruling system and with the internal borders drawn in Yugoslavia in this way an artificial balance of power was established - the idea taken over from the Austro- Hungarian Balkan policy at the end of the 19th century. Having in mind this political background, it is quite clear why in the defining of the boundaries of the federal units none of the historical, ethnic or geographical reasons were observed nor was any opportunity given to the people to express their own free democratic will as to the boundaries within which they wished to live. The leading Serbian communists blindly served such political strategy for the sake of their careers and interests though it was meant against their own people. Thus, it was possible to happen that the territories that had for centuries been the part of the Old Serbia and within the boundaries of the restored Patriarchate of Peć (1557-1776), until its abolition, became part of the People's Republic of Macedonia. In the course of almost a half-century long existence of the Yugoslav federal unit under this name, the concept of Macedonia expanded much beyond its historical-geographical boundaries in the north. By the one-sided secession of this federal unit not only was the heritage of the Serbian struggle for liberation in the 19th century endangered but also was the portion of the Serbian people living in this former Yugoslav republic separated from their motherland and pushed to the position of a national minority to which neither basic national nor human rights were guaranteed. Besides historical and ethnic reasons, the geographical ones are obvious when the union of this area with the area of the Serbian and Yugoslav state is in question: the Morava-Vardar river basin which "unites" this area into a single geographical whole offering natural communication and economic entirety and compatibility. Besides the geographical role, the Morava-Vardar basin also has an important geopolitical role and for centuries it has been the pivot of the political and cultural development of the Serbian people. Unfortunately, neither the public here nor the international public are aware of the facts that the Serbs, the Serbian cultural heritage and tradition are present in the area of the Former Yugoslav Republic of Macedonia (F.Y.R.M.). This is not surprising if one considers that this topic was not to be tackled in this Republic and in others as well, primarily for ideological reasons. Every attempt to present facts was interpreted as an expression of "the tendencies and territorial claims on the pair of the Greater Serbia". This position resulted from the ideological viewpoints of the Communist Party of Yugoslavia on the nation and the national question in Yugoslavia. The substance of the concept lay in the idea that the national question was a "revolutionary question" and, actually, by stirring up regional and religious feelings the "capitalistic creation" could be most easily destroyed. The term which was used for the Yugoslav state by the communists. That was the milieu in which the idea on the Macedonian nation and the Macedonian federal unit was born. Some local features of the Macedonian Slav population served as an argument in favour of proclaiming a separate nation. This led to neglecting a whole array of historical and other facts decisive for understanding the Macedonian question as a whole and the problem of the Former Yugoslav Republic of Macedonia in particular. In the ethnographic aspect, Macedonia has always represented a true medley of peoples and religions, mostly the Slav and non-Slav population. For this reason, the term Macedonian has always had a solely regional meaning, and not ethnic or national. The Macedonian Slavs, besides the feeling of closeness with the Serbs and Bulgarians, depending on whether the region in which they lived bordered on the one or the other people, also shared the feeling of regional adherence. This feeling of regional adherence never appeared in the form of affiliation to any particular nation nor was a strife for a separate state. Only some sort of consciousness of autonomy appeared, but primarily as the result of the Serbian-Bulgarian dispute over Macedonia. One should not overlook the fact chat, apart from the Slavs, the Greeks and Cincars have always lived in the region of Macedonia, and later the Turks, Albanians, Jews and others. 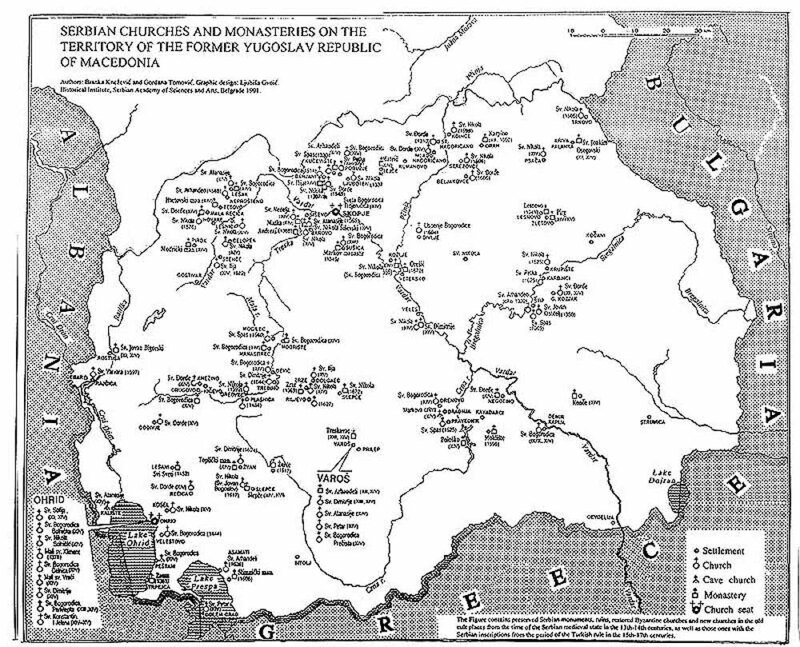 This ethnographic medley characteristic of Macedonia was also characteristic of the area that was later delineated as the area of the Republic of Macedonia. This was not the case, however, for the area that entered the Greek state after the establishment of the Serbian-Greek border in 1913. As for the Slavs, besides those that felt as Serbs or Bulgarians, there were transitional zones in which either the Serbian or Bulgarian influence was somewhat more felt. On the territory of the F.Y.R.M. both the Serbs and Bulgarians started exerting their Influence as early as in the 9th century, the Bulgarian influence being more political by nature and earlier in time, and the influence of the Serbs from the end of the 13th and in the course of the 14th century was not only political but also cultural, as it can be seen in the numerous Serbian monuments of culture preserved till the present day. In the 19th century, the government of the Principality of Serbia took care of the destiny of the Serbian and Slav people in Turkey and in Macedonia as well. It was an integrational effort to help the Slav revival in the Balkans, in which Serbia had a leading role. As early as in 1848, the Serbian government prepared The Motion to the Porta on the Interior Structure in Macedonia with two main requests: the independent election of the district and nahye princes as it was in Serbia in the times of Hadzi Mustafa pasha, and the nomination of bishops and metropolitans of the Slav nationality. The renowned Serbian statesmen Ilija Garašanin wrote a detailed study in which he pointed to the suffering of the Slav population in Turkey and to the oppression of the Slavs by the "Turkish rulers and Greek bishops". A stronger Bulgarian influence was resumed in the mid 19th century, particularly after the proclamation of the Bulgarian Exarchos in 1870, whose aims were more of a political than spiritual nature and served, besides the righteous struggle for the national emancipation of the Bulgarians, as a means to Bulgarize a pare of the Serbian and Macedonian Slav population. This activity of the Bulgarian Church served the unconcealed tendency to ensure the hegemony of Bulgaria in the Balkans (Bulgaria of San Stefano). The Serbian presence and tradition were a great hindrance to such tendencies of the Bulgarians and also to their patrons among the Great Powers whether this be Russia, on one side, or Austria-Hungary and England, on the other. The Serbian rulers and the Serbian medieval noblemen built numerous churches and monasteries in the central Balkan regions in which the Serbian art boomed. The evidence of this is found in the sources of different origin. Around Skopje, Prilep, Ćustendil (in western Bulgaria today), Kumanovo, Kratovo, Štip, around Tetovo, in the Crna Reka river valley, around Debar and Ohrid, and in other regions, there are dense clusters of Serbian churches of which many still exist. 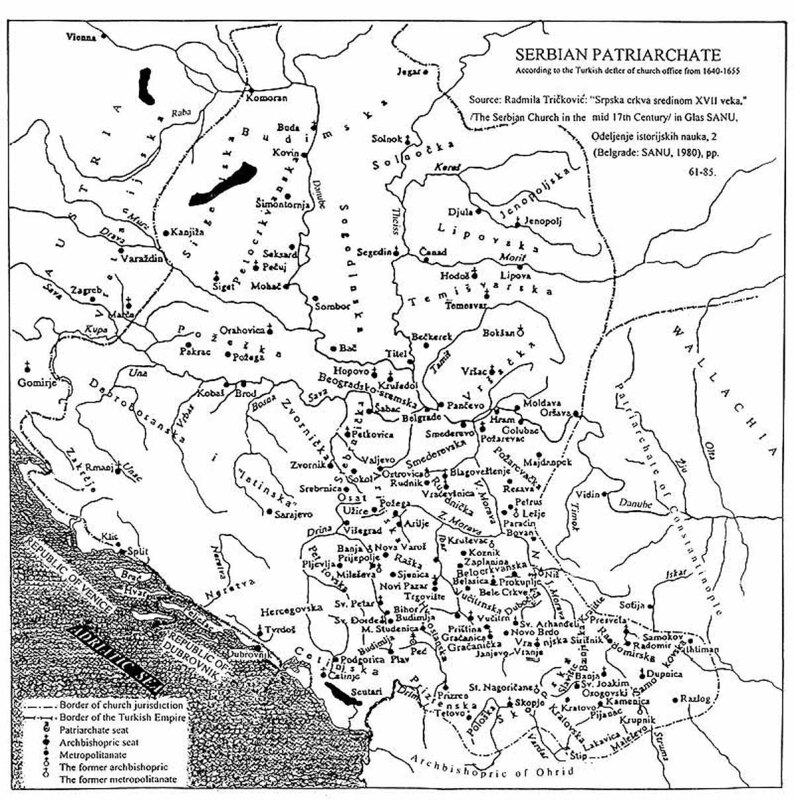 Moreover, under the Ottoman Empire, the districts of Skopje, Kumanovo, Tetovo, Poreč, Kratovo, Štip and Radovište belonged to the Patriarchate of Peć until its abolition. Skopje was proclaimed the capital of the Macedonian federal unit when the Yugoslav communists came into power although it had always been a part of the Old Serbia. On almost all geographical maps by the western cartographers of the 17th and 18th centuries, Skopje was marked as the part of the Serbian lands, and since the end of the 19th century until the liberation from the Turkish rule it was the sear of the Kosovo vilayet that included most of the territory of the Old Serbia. The largest part of the classical Macedonia belonged to the Bitolj and Salonica vilayets. Already in the first half of the 19th century, numerous political, economic and social links existed among the population of these lands and the Principality of Serbia and other Serbian lands. A major portion of the Serbian population in the Principality, particularly town dwellers, had their origin in the Former Yugoslav Republic of Macedonia. Many prominent chiefs in the First Serbian Uprising came from these regions: Petar Novaković-Čardaklija (from the village of Leunovo - Gornji Polog), Janko Popović (of Ohrid), Marko Krstić from Bjelice, Vuča Živić from Mavrovo, Dositej Novaković from the village of Dabnica near Prilep, etc. It is no wonder, then, that Gedeon Jurišić in his well known Dečanski prvenac (1852) wrote of Tetovo as the pride of the "Srpsrvo" /Serbs/, while he considered the citizens ofTetovo "the model of his nationality". If it had not been so, would the Principality of Serbia, though poor, have paid generously the Serbian schools and teachers in the middle of the last century? Would it have sent books and church articles and have aided the work of churches and monasteries in many other ways? That this tradition has deep roots is confirmed by the monuments of the old Serbian literature found in the last century in the area of the F.Y.R.M. As early as at the beginning of the seventies of the 19th century, there were dozens of Serbian schools in this region. A small number of these schools had existed before this period. They presented the primary forms of teaching literacy in some of the monasteries or in private houses. With time, modern forms of tuition were adopted. In 1843, for example, Spiridon Jovanović started teaching in Veles and in 1854, Andjelko Cvetković became a teacher in Skopje. Sima Damjanović, born in Bosnia, taught in Bašino Selo from 1856 till 1873; Jovan Nešković, born in Pest, Hungary, taught in Veles from 1857 till 1860. In the course of the eighties of the 19th century, Serbia took care of the political and educational-cultural needs of the Serbian people in Turkey and this activity became an integral part of the Serbian foreign policy. These tasks were pursued by the cultural societies (the Society of St. Sava) and institutions, and also by the Serbian consular offices stationed in the Old Serbia and Macedonia: first in Skopje (1887) and Salonica (1887), and then in Bitolj (1889) and Priština (1889). The Serbian consular office in Serez was in operation since 1897. At the end of the 19th century, the Serbian schools in the Old Serbia and Macedonia grew significantly in number in spite of hindrances imposed by the Turkish rule and the representatives of the Bulgarian Exarchos, and even the Patriarchate of Constantinople. For example, in the Sanjak of Skopje of the Kosovo vilayet during the 1892/93 school year, 775 pupils attended elementary schools, 612 boys and 163 girls. Apart from Skopje and the villages north of Skopje, the elementary schools were established in Kratovo, Kočani, and Berovo. In the next school year there were already 29 elementary schools (1058 pupils) in the Sanjak of Skopje. Multiple centuries-long profound links of a good portion of the people from the Former Yugoslav Republic of Macedonia primarily with Serbia, then with other Serbian countries, are seen in the deeply rooted Serbian tradition which is expressed not only in folk customs and heritage but also in the ethnographic and literary heritage of the people from this area. The tradition of Slava, which is inherent to the Serbs only, existed in the largest portion of the area that belongs to this former Yugoslav federal unit. The old Serbian traditions and customs, such as: the poems about St. Sava, Dushan's wedding, Marko Kraljević/Marko the Prince/, King Vukašin, Karadjordje were also present in this area. The Macedonian epic poems told of other Serbian heroes as well. One of the best Serbian story-tellers from the beginning of this century was Andjelko Krstić, born in the village of Labunište, Drimkol (the Drimkol area includes Struga, Podgorac, Labunište, Borovac, Jablanica, Vevčani, Nereze, and other places). In his novel Trayan, he described very vividly the lives of the Macedonian migrant workers: at home, personal relationships, then- relationship with the Turks, their work abroad. The valuable material on the life of the people in the Drimkol of Debar was collected by Mihailo Veljić, the striking notes from Kratovo were written by Stevan Simić, while Tomo Smiljanić Bradina described Mount Galičnik and the people living there. Kočović and Kavajac, two story-tellers from Struga, left their traces in the Serbian literature. These numerous sources speak persuasively of the power of the Serbian tradition in the mentioned areas of the Old Serbia and Macedonia and about the imbuing of this tradition with folk and cultural heritage of the Serbs on the whole. At the end of the 19th century and at the beginning of the 20th, Skopje was the centre of the political life of the Serbs in Turkey. Immediately after the revolution of the Young Turks, the conference of the Serbian leaders in Turkey was held in Skopje in August 1908, and the decision was passed to found the Serbian democratic league, its objective being "...to aid the establishment of civil freedoms and constitutional life." From February 2 to 11, 1909, in Skopje, the National Assembly of the Serbs in Turkey was held and the Constitution of the Serbian National Organization in the Ottoman Empire was passed; the requirements concerning education, political and economic life of the Serbs in Turkey were proclaimed. Besides the Chief Committee seated in Skopje, there were four district committees: for the Raška-Prizren eparchy, for the Skopje eparchy, for the Bitolj vilayet, and for the Salonica vilayet. Let us mention only several deputies to the Serbian National Assembly in Skopje. From Bitolj and surroundings: Jovan Ćirković, Rista Cvetković, Gligorije Božović and Rista Stavrić; from Veles and surroundings: Djordje Stamenković, merchant; from Debar and surroundings: Dr Isailo Hadžijevski, physician; from Dojran and surroundings: Jovan K. Grošević, teacher; from Drimkol and surroundings: Matija Šumenković, priest; from Djevdjelija and surroundings: Stojan Ristić; from Kičevo and surroundings: Janićije Djurić, baker, and Jovan Č. Tomić, peasant; from Ohrid and surroundings: Serafim Krstić, priest; from Prilep and surroundings: Gligor Sokolović, chief, and Petar Dimitrijević, merchant; from Voden and surroundings: Stojan Marković, merchant, and so on. With the growing of the economic power of the Serbian merchants and with an increasing number of educated persons, a class of Serbian city-dwellers was formed, at first rather sparse but gradually becoming more noticeable and the main factor in the social and cultural renaissance of the Serbs in the Old Serbia and Macedonia. The grammar school in. Skopje had the highest possible reputation among the Serbian high schools in Turkey. This social class initiated a comparatively fast economic and cultural renaissance of these districts after the Balkan wars 1912/1913 and especially after World War I. At the beginning of 1914 the National theatre was opened in Skopje. The director of the Theatre was the well-known Serbian comedy writer Branislav Nušić. Since the old theatre building was soon destroyed in fire, a new building was built in 1927. The City theatre was opened in Bitolj in November 1913, and after World War I, the City theatre was opened in Štip in 1926. Also, after the First World War, many important educational, cultural, and health institutions were established within the boundaries of the new Yugoslav state. The Faculty of Philosophy was founded immediately after the war, in 1920, and soon after it the Skopje Scientific Society, in 1921. The society published an excellent periodical: Glasnik Skopskog naučnog društva /Herald of the Skopje Scientific Society/ (as many as 17 books of the Bulletin were published in the period 1925-1937). In 1925, the Great Muslim theological secondary school named "King Alexander" was opened in Skopje, and in 1937, the theological school of Gazi-Isa bey. The Students' hostel in Skopje named "King Peter the First" was built in 1931. Among some of the cultural societies in Skopje between the two World Wars, there were also five singing societies, the Skopje String Quartet (1933), the Cultural Society "Jefimija" (1930) that emulated the Belgrade Society "Cvijeta Zuzorić", the Society for Promotion of Tourism "Jug"/South/ (since 1927), the Flight Club "Naša krila" /Our Wings/, and other societies of the kind. Besides the National Hospital in Skopje, new hospitals were built in Veles, Tetovo, Djevdjelija, Ohrid, Štip, Kumanovo and some other places after World War I. All this shows that the Kingdom of Serbia, and later the new Yugoslav state as well, endeavoured to overcome the differences in development levels between the earlier liberated lands and the newly liberated territories after the Balkan wars. The Bulgarian occupying regime in the First and particularly in the Second World War, and most of the leaders of the Macedonian regime after the Second World War, strove to annul the development achievements of these regions within the Serbian and Yugoslav state before 1941. Instead of the facts, the official ideological propaganda spoke only of the "oppression by the Serbian nationalism" and the "occupation" of Macedonia. This systematic and persistent propaganda imbued all the layers of society, first of all education, culture, public media, scientific activities, advocating repulsion and even hatred of the Macedonian people towards everything that was Serbian. Unfortunately, it was a rather successful process that went on. So, instead of strengthening natural traditional connections with Belgrade and other Serbian economic and cultural centers, the education of the new Macedonian intelligence was primarily directed towards Zagreb. For the last half century, from 1941 until our times, a systematic long term policy was pursued to push the Serbs out of the Macedonian federal unit, and then to deprive of their national identity those Serbs that remained to live on their own old hearths. Could one not speak here of "ethnic cleansing"? With the arrival of the Bulgarian occupying army in 1941, after Hitler's attack on Yugoslavia, mass expulsion of the Serbs from the area of the F.Y.R.M. took place. First, the city dwellers were deported in 1941, then all of the suspected pro-Serbs, i.e. all those who did not consent to be forcefully proclaimed Bulgarians. In the summer of 1941, mass arrests and the deportation of the Serbian rural population starred in the Kumanovo, Veles, and Tetovo districts. And then, to complete the absurdity, the new Communist regime authorized the situation created by the Fascist occupation and enacted a law on prohibiting the return of the expelled Serbs! A large number of those who acceded to the Bulgarian Fascist occupier in 1941 ranked high in the organization of the new Communist rule and Macedonian state later on. Therefore, it is not surprising that already in 1944 the remaining Serbian population in the People's Republic of Macedonia was the object of brutal deprivation of their national identity. With the colonizing methods applied in 1947, some regions were emptied and the number of Serbs or those who were traditionally linked to Serbia decreased. Thus, about 22,000 people from Poreč, Kičevo, Kriva Palanka and Kumanovo were settled in Vojvodina. Immediately after the liberation from the occupying forces, in 1945, the requests to become a part of the newly formed federal unit of Serbia came from some regions of Macedonia in spite of the terror of the new Macedonian government. The typical example was the plea of the rural population in the Vratnica municipality, Tetovo district. In a letter to the minister for Serbia in the Government of the Democratic Federal Yugoslavia the inhabitants of these villages stated: "We, the Serbs from the Vratnica municipality have never felt otherwise but as Serbs, the same as our ancestors, and it has been so for centuries. Because of that we suffered extremely during the occupation both in the last World War and in this one that ended recently. During the occupation in this war, 41 Serbs were executed by firing squads, some were Interned and there was not a single Serb between the age of 15 and 66 that was not beaten and molested to exhaustion." The inhabitants in the Vratnica municipality also complained about the new Macedonian officials and listed the main reasons such as: "In our district the administrative authorities are mostly constituted of the persons who were Fascist collaborators, the persons who welcomed the German army with delight, the persons who held religious service of thanksgiving when the German armada was victorious though the Germans never requested such things from the city dwellers." Even an example is given: during the occupation the village representative in the Vratnica municipality was Andra Hristov from Tetovo (in the Kingdom of Yugoslavia he was a clerk in the Tetovo district court, but then his surname was Serbian - Ristić), who is now said to be "...an official of the people's administration authorities in Skopje. In the whole period after the Second World War the Serbs in the Socialist Republic of Macedonia were kept from freely developing their national and cultural identity. The Serbs were, in the true sense of the word, the citizens of the second order. The Macedonian authorities changed their surnames by force, substituting "ić" with "ski " (Jovanović - Jovanovski) most often when issuing personal and other documents. The attitude of these authorities towards the Serbs was best illustrated in the attitude towards the Serbian monuments, particularly towards the army cemeteries and mass mausoleums from the period 1912-1918. We are witnessing the disrespect of the elementary norms of civilization. The monument and the mausoleum on Zebrnjak (erected in 1937 to the memory of the Kumanovo battle in the First Balkan war of 1912) was pulled down by the Bulgarian occupying army in the Second World War. After the war only the base section, i.e. the ruins and remnants, was protected because the Macedonian authorities did not allow the restoration of the monument. In the vicinity of the monument a quarry was opened and the existing monument remnants were exposed to further destruction. The mass crypt holding the bones of 40,000 warriors and dwellers of Kumanovo and the surroundings who died of typhoid in 1912 was furrowed. The Cemetery of the fallen warriors in 1912 located in the churchyard of St. Trojica was destroyed; the memorial chapel and the crypt of the fallen at the Bregalnica river in Štip was destroyed during the Second World War, while after the War the place was used for a meteorological station; the Soldiers' cemetery with the chapel and the crypt from World War I in Štip in which many a thousand fallen warriors were buried was displaced, while their earthy remains were not marked; through the Serbian soldiers' cemetery in Bitolj runs a rural road; among the monuments pulled down in Skopje we should mention here the monument to the Pupils of Skopje, the monument to King Peter I, the monument to the Fallen Warriors 1912-1918. The mausoleum in Ohrid to the memory of 400 young men the refugees from Serbia, captured during their escape in 1915 and shot by the Bulgarian komitadjis, was demolished in the course of the Second World War. After the war nothing was done to restore it, and there are many examples of the kind. When the Autocephalous Macedonian Church was proclaimed, contrary to the existing canons, the Serbs were deprived of their Church since the "Macedonian Church" presented itself to be the Church of all the Orthodox people on the territory of the Macedonian republic. The paradox was even greater since the establishment of this Church was urged by the League of Communists (namely by the republic and federal authorities of the League of Communists of Yugoslavia in which the Slovenes and Croats had the main say), the party that separated the Church from the state. Apparently, this Church was to play a certain role in the disintegration of the Serbian ethnic and cultural area and of the Yugoslav state community as well. The future studies will certainly reveal the true role of the Vatican in all this, since the Roman Catholic Church showed benevolence towards this self-proclaimed Church. Today there are no reliable data on the number of the Serbs in the F.Y.R.M. since there are many reasons to doubt the truthfulness of the official data of the Macedonian authorities. The only reliable data that could be accepted are those that could be obtained by the declaration of the population under the supervision of an unbiased international commission. This number is certainly far greater than the number computed in the official census, which proves to be true if we study the statistical data of the Turkish authorities (and the data from other sources) before the Balkan wars, as well as the censuses between the two world wars. According to the data published by Jovan Cvijić in the study The Annexation of Bosnia and Herzegovina and the Serbian Issue (Belgrade, 1908) there were 280,000 Serbs in the region of Skopje (the districts of Skopje, Tetovo, Kumanovo, Preševo, Kratovo, Kriva Palanka, Kočani, Pehčer, Štip, and Radovište) and 300,000 in Macedonia (within the full historical-geographical boundaries of this notion) in 1908. In other words, in that part of the Old Serbia and in Macedonia there were 580,000 Serbs. Cvijić was of the opinion that in Macedonia there were also about one million Macedonian Slavs. If the world accept the one sided secession of the Macedonian federal unit and recognize it as an independent and sovereign state in the international community, the Macedonian question may again become one of the burning questions in the Balkan region. The neighbouring Bulgaria has never concealed its aspirations towards this territory, and is not concealing them now either, because the recognition of the independence of the Socialist Republic of Macedonia seems to Bulgaria to be just one phase on the way to finally annexing Macedonia to the Bulgarian state, which will realize the hegemony of Bulgaria in the Balkans. It goes without saying that this will give wings to Greater Bulgarian aspirations to the Greek part of Macedonia, towards Thessaloniki, which may Ignite a period of long lasting instability, if not open conflicts, in the Balkans. If the really strong Albanian separatist movement in the F.Y.R.M. and its aspirations to become a part of the Greater Albania is added to the above, then it is quite logical that the future of an independent and self-sufficient Macedonian state is extremely uncertain. There are indications that a possible agreement between Bulgaria and Albania on the division of the territory of the F.Y.R.M. may be made. The statements of the supreme Turkish statesmen on the political ambitions of their state (the area of the Ottoman empire as the Turkish sphere of interest) fit with the strategy of radical rearrangements in the Balkan area. In this strategy, the processes in the southern part of the Balkans would obviously develop under the patronage of the Turkish imperialistic ideas. Having in mind all these interior and exterior factors, the flow of events has, no doubt, fully opened the Serbian question in the Former Yugoslav Republic of Macedonia. The only fair and democratic solution would be to recognize the right to self-determination to the Serbs, as they are compelled to live apart from the rest of the Serbian people due to the act of forced secession and contrary to their will. This will of the Serbs can be verified in a plebiscite conducted under an unbiased international supervision. At present, the minimum guarantee that should be given to the Serbs in the F.Y.R.M. is the security of all the rights to free political, educational, cultural and spiritual organizing and activities and, on the basis of these, the non-interfered connections with their compatriots in all of the Serbian countries. 1. Fikret Adanir, Die Makedonische Frage, Hire Entstehung und Entwicklung his 1908 (Wiesbaden: Franz Steiner Verlag GMBH, 1979); Dakin Douglas, The Greek Struggle in Macedonia 1897-1913 (Thessaloniki, 1966); Eduard Anželar, Maćedonsko pitanje, Sadašnje stanje - rešenje/The Macedonian Question.../ (Belgrade: Nova Štamparija "Davidović", 1906); Stojan Novaković, Balkanska pitanja i manje istorijsko-političke beleške o Balkanskom poluostrvu 1886-1905 /The Balkan Questions and Brief Historical-Political Notes on the Balkan Peninsula/ (Belgrade: Zadužbina I. M. Kolarca, 1906); Jovan Cvijić, Promatranja o etnografiji makedonskih Slovena /On the Ethnography of the Macedonian Slavs/ (Belgrade: Geca Kon, 1906); Maćedonsko pitanje by*** /The Macedonian Question/reprint from SKG/ (Belgrade: Nova Štamparija "Davidović", 1908); Pavle Orlović /Svetislav Simić/, "Maćedonija i maćedonsko pitanje," / Macedonia and the Macedonian Question / in Srpski književni glasnik (1902), VI, issue 8, pp. 1264-1269; Pavle Orlović /Svetislav Simić/, "Maćedonsko pitanje i turkofilstvo," /T. he Macedonian Question and pro-Turkish Feeling/ in Srpski književni glasnik (1902), VIII, issue 6, pp. 459-467; Stojan M. Protić, O Makedoniji i Makedoncima, I On Macedonia and the Macedonians/ 2d ed. (Belgrade: Štamparija K. S. Taušanovića, 1928); Svetislav Simić, "Jedno bugarsko mišljenje o Maćedonskom pitanju," /A Bulgarian Position on the Macedonian Question/ in Srpski književni glasnik (1901), I, issue 3, pp. 206-215, issue 4, pp. 274-287; Marko P. Cemović, Makedonski problem i Makedonci /The Macedonian Problem and the Macedonians/ (Belgrade: Uredništvo "Dela", 1903);Jovan Hadži Vasiljević, Prosvetne i političke prilike u južnim srpskim oblastima u XIX veku /Educational and Political Circumstances in the Southern Serbian Regions in the 19th century/ (Belgrade: Društvo Sv. Save, 1928); Dragan Taškovski, Radjanje makedonske nacije /The Development of the Macedonian Nation/ (Belgrade: Zavod za izdavanje udžbenika SR Srbije, 1969). 2. Ugovor o miru sa Bugarskom /Treaty of Neuilly/ Belgrade, 1927, pp. 20-22, 26-28. The border between Bulgaria and the Kingdom of Serbs, Croats and Slovenes was established by Clause 27. 3 Miodrag Zečević and Bogdan Lekić: Državne granice i untrašnja teritorijalna podela Jugoslavije/The State Boundaries and the Internal Territorial Division of Yugoslavia/ (Belgrade, 1991). 4. Radmila Tričković: "Srpska crkva sredinom XVII veka. /The Serbian Church in the mid 17th century/ in Glas SANU, Odeljenje istorijskih nauka, 2 (Belgrade: SANU, 1980), pp. 61-85. 5. Vojislav S. Radovanović, "Geografske osnove Južne Srbije," /Geographical Elements of Southern Serbia/ in Spomenica dvadesetpetogodišnjice oslobodjenja Južne Srbije 1912-1937 (Skopje, 1937), pp. 3-48. 6. Desanka Pešić, Jugoslovenski komunisti i nacionalno pitanje 1919-1935 /Yugoslav Communists and the National Question.../ (Belgrade, 1983). 7. Jovan Cvijić, Promatranja o etnografiji makedonskih Slovena, pp. 7-36. 8. Milenko S. Filipović, "Etničke prilike u južnoj Srbiji," /Ethnic Circumstances in Southern Serbia/ in Spomenica..., pp. 387-419; Stojan Novaković, Balkanska pitanja..., pp. 307-408. 9. Arhiv Istorijskog instituta Beograd (AII), Fond Nikolajević-Ljotić, inv. br. 1/588, sign. 1/17, I. Garašanin to K. Nikolajević, May 10, 1848; Ibid., inv. br. 4/10, sign. IV, 1848, Predlog Porti o unutrašnjem uredjenju Makedonije /The Motion to the Porta on the Interior Structure in Macedonia/. One of the leading Serbian diplomats from the beginning of this century Milovan Dj. Milovanović spoke in favour of an "open agreement" with the Bulgarians on the Macedonian question. He wrote: "Tills agreement should be die only lasting and rightful solution to the Macedonian question." (Milovan Dj. Milovanović, "Die Macedonishe Frage," Die Zeit, No. 105, October 3, 1896). 10. Franc Mesesnel: "Stari srpski spomenici," /Old Serbian Monuments/ in Spomenica..., pp. 364-385; Gordana Tomović, "Srpske crkve i manastiri u SR Makedoniji,"/ Serbian Churches and Monasteries in the SR of Macedonia) in Politika (Belgrade: February 2, 1992); Map: Srpske crkve i manastiri u SR Makedoniji (Belgrade: Istorijski institut SANU, 1991). 11. Dalmatia, Slavonia, Croatia, Bosnia, Servia et Istria ... per Gerardum et Leonardum Valu (1700-1720); Danubius (Ister)... Christophoro Weigelio Noriberge (1724); Danubii Fluminis... Pars Media... a Ioh... Bart. Homanno, Norimberge (1664-1724); Sebastiani Munsteri Cosmographia - Nuova descrizzione della Polonia e dell' Ungaria; Il regno della Servia, Giacomo Cantelli da Vignola 1689. 12. Miloš I. Rakić, "Nacionalno budjenje," /National Awakening/ in Spomenica..., pp. 232-233. 13. Vasilije Krestić and Radoš Ljušić, eds., Srbija i oslobodilački pokreti na Balkanu od Pariskog mira do Berlinskog kongresa / 1856-1875/ Serbia and the Liberation Movements in the Balkans from the Paris Peace to the Congress of Berlin/ (Belgrade, 1983), 1,1-210. 14. 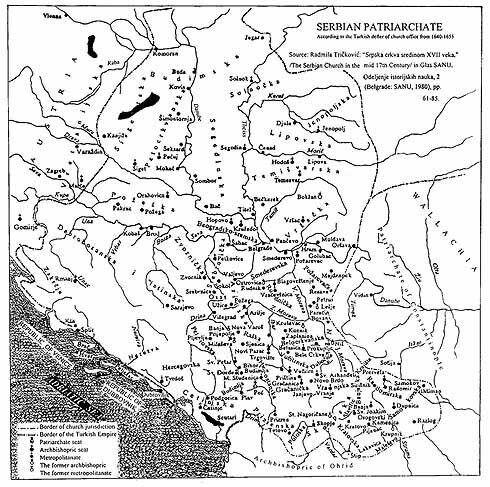 Jovan Ristić: Spoljašnji odnošaji novijeg vremena /Exterior Relations of the Recent Times/ (Belgrade, 1901), III, 278-285. Ristić writes about 70 boys' and 7 girls' schools and one seminary in the Old Serbia and Macedonia at the beginning of the seventies of the 19th century. Among other places, the schools worked in Kičevo, Skopje, Gostivar, Debar, Kruševo, Lazaropolje, Tetovo and surroundings, Kočani, Zletovo, in the districts or Veles, Ohrid (Leštani, Borovac, Vevčani villages), Skopje, etc. The war events 1876-1878 stopped this process and caused the Serbian schools to close down and reopen at the end of the 19th century. 15. Aleksa Jovanović, "Srpske škole pod Turcima,"/Serbian Schools under the Turks/ in Spomenica..., pp 245-256. 17. Slobodan A. Jovanović, "Nova književnost," /New Literature/ in Spomenica.... pp. 847-855. 18. Rad Narodne skupštine otomanskih Srba, februar 2-11, 1909 /The Sessions of the National Assembly of the Ottoman Serbs/ (Skopje, 1910). 19. "Školstvo Južne Srbije od 1912. do 1937," "Društva i ustanove," /The Educational System in Southern Serbia... in Spomenica..., pp. 929-1034. 20. There is a long tradition in the cooperation of those circles of Croats and Bulgarians that endeavoured to establish Croatian and Bulgarian hegemony on the Balkans. In the letter signed Ćira (? pseudonim) sent from Sofia to Vlada Ljotić (Oct. 5, 1885), different opinions of the public and of the Bulgarian intelligentsia about the Serbs were discussed. The intelligentsia, as it was emphasized in the letter, had "a hostile position". The author pointed out that the Bulgarian intelligentsia "derived their political views from Zagreb." (All, Fond Nikolajević-Ljotić, inv. br. 9/113, sign. IX/4). In the town of Delčevo in honour of the birth of Goce Delčev "Days of Goce" the posters and slogans were written in Bulgarian. Večer, the Skopje newspaper, speculated why the Macedonian language was ignored as the "official language in the Republic of Macedonia" although it "did not mind the use of the Bulgarian language in such circumstances." Borba (Belgrade, February 11, 1993). 21. Arhiv Jugoslavije, Predsedništvo Vlade, f.33, a. j. 65. 23. Jovan Cvijić, Aneksija Bosne i Hercegovine i srpski problem /The Annexation of Bosnia and Hercegovina and the Serbian Problem/ (Belgrade, 1908), p. 19. According to the data by Bianconi of 1885, accepted by Justus Petersov, The Institute of Geography in Gotha, there were 70,000 Serbs in the Scutari region, while the well-known Czech ethnographer Lubor Niederle, some time later, thought that in the Scutari region with Plav and Gusinje there were about 100,000 Serbs (Cvijić, p. l8). Cvijić was of the opinion that these data were exaggerated. 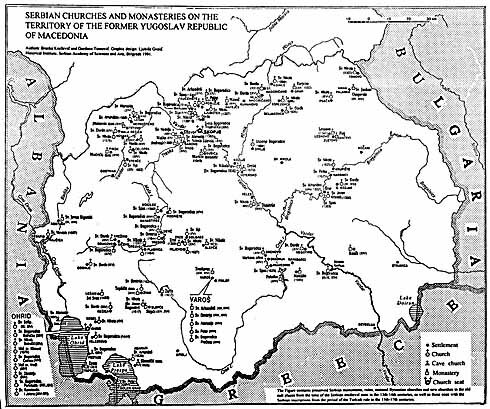 Richard von Mach, the writer of a study on the Macedonian question, though mainly supporting the Bulgarian aspirations, had to admit that the regions of Kumanovo, Skopje and Tetovo were inhabited by the Serbs. He pointed out a deeply rooted habit in Bulgaria to enumerate all the Macedonian Slavs into Bulgarians and to consider the entire Macedonia as the future integral part of the Bulgarian state. However, according to Mach, the Macedonian question cannot be solved in the Bulgarian sense, but a favorable solution to this question can be made only by an agreement between Serbia and Bulgaria (Richard von Mach, Die Macedonische Frage mit finer Beilage, "Statistik der Bulgarischen Volksschulen in der europaischen Turkei," Wien, 1895). Dr Slavenko Terzić, Historian and Balkanologist, is Director of the Historical Institute, Serbian Academy of Sciences and Arts in Belgrade. His major areas of interest are History of Serbia and the Serbian People in the 19th century and at the beginning of the 20th, and History of the Balkans. In addition to numerous studies and articles (over fifty) on various aspects of this field, he has also published Srbjja i Grčka (1856-1903) -Borba za Balkan- /Serbia and Greece [1856-1903] -The Struggle for the Balkans -/ (1992); Srbija i Balkansko pitanje krajem 19 veka: povratak starim središtima /Serbia and the Balkan Question at the End of the 19th century: Return to the Old Roots/ (1992); Benjamin Kalay i srpsko pitanje /Benjamin Kalay and the Serbian Question/ (1992); Srpsko pitanje izmedju Rusije i Zapadnih Sila /The Serbian Question between Russia and the Western Powers/ (1993); Old Rashka (1993), and Ethnic and religious in the Serbian history problems of the national Integration's in the 19th and 20th centuries (1994). At present, Dr Terzić is working on the book Russia, Slavophilism and the Serbian Question.